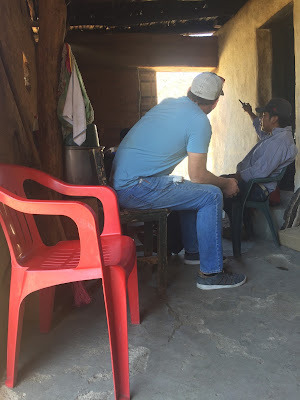 I entered the church building and tried to inconspicuously walk across the room, in front of the small body of believers already gathered and listening to Vicente speak. My eyes were still adjusting to the darker room after being out in the bright hot sun, I had found my way to Don and was beginning to sit down when I noticed that the room was separated with men sitting on one side and women on the other. There I was, finally in the context I had been preparing for for so long, about to blow it culturally in no less than 1 minute. I handed Don the baby, faking that was my intention the whole time and quietly went over to the women's side. Thankfully it didn't seem to be a big deal and we can be thankful we will be working with people who are accustomed to gringo missionaries and our oddities. One of the believers, Marcario, and Vicente's uncle. 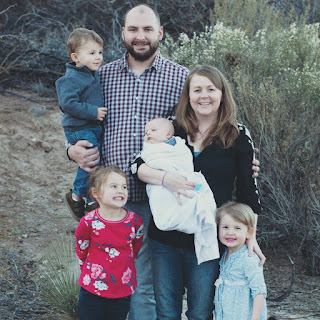 Even though we are not ready to move out to the tribe permanently (see blog titled "Why is it taking Chrissy so long to learn Spanish"), we wanted to take this trip as a family and are so glad we were able to! Our co-workers have been working out there for around 8 months, without co workers for much of that time. We wanted to go spend time with them, hoping to encourage them, grow closer as a team and just begin getting to know the people and the area. This was the first time I've been able to visit there and I really loved it. While we were there we were able to attend two of the church services lead by our co worker Vicente. It was incredibly encouraging to meet and talk with a few of the believers and to feel the immediate communion that we have as believers. Later during the week we visited inside the porch of an adobe house, getting to know a few individuals we hope to someday know well. The children played with handwoven baskets as we made small talk. Throughout our ten days hidden out in the mountains I couldn't stop thinking of how strangely comfortable I felt in this context. I certainly can't assess how I will feel after spending more time out there and I'm sure I looked like a big weirdo to them, but after spending so much time talking about a context just like this it felt right to finally be there. I had to remind myself that this time it's the real deal, not a practicum with actors or a familiar video clip from a far off people group I'll never know.. In this real life scenario, every choice we make has the potential to affect someone's eternal destination, and even though the context feels right, no amount of training really prepares you for something as weighty as that. We know the devil is actively working to stop the Guarijio people from hearing God's word and the believers from growing. Our family and the Tigre family have targets on our backs. Right now we feel excited to step into this ministry, but we are sure we don't know the hard times we will face and the way our flesh will show itself. Please pray for our families to be encouraged, our marriages to be strong, our children to remain healthy and happy and most of all for us to depend on the Lord and grow closer to Him through everything we are going to face.